I've spent the past hour watching the breaking news coverage of John Edwards admitting to having an extramarital affair. ABC News broke the story when Edwards admitted it today during an interview that's being taped to air on Nightline tonight. Shame, shame on the former North Carolina senator and presidential candidate. I used to look up to Edwards. He's a Carolina boy who made it out of poverty to earn his law degree and to become a rich and successful attorney. But unlike many who've "made it," Edwards has dedicated his life's work to a mission to end poverty. Sure, he caught a lot of flack last year for his $400 hair cut, but the man was on the path to being a great leader. Until now. Rumors of Edwards' affair plagued him for months. All the while he denied it, often times refusing to answer the question, appearing insulted by it. Most likely he admitted to the affair with Rielle Hunter, a filmmaker whom he had hired to film web videos during his campaign, because of the looming Democratic National Convention. Edwards wouldn't have wanted to be a distraction and people would have wondered why one of the party's brightest stars wasn't there. Now they know why he won't be there. I used to look up to you, sir. I'm disappointed in Edwards. Sure, he's human; people make mistakes; nobody's perfect; he isn't the first and won't be the last to cheat; saints have a past and sinners have a future. But I'm disappointed in Edwards mostly because he's weakening my argument. I get into frequent discussions with a good friend of mine who says she believes that all men cheat. She says if and when she decides to get married, as difficult as it may be, she'll just have to bring herself to accept that and hopefully she and her marriage would be able to survive it. I tell her that I don't think all men cheat. I'm not married, but I've never cheated on a girlfriend (do you see the halo above my head?). And I have no plans to ever cheat. But perhaps men like John Edwards, who's been married for 31 years, whose wife has cancer nonetheless, never planned to cheat either. In a time when fewer people are getting married and even fewer are staying together, I need a reason to believe. I need the guy who cares so much about ending poverty, who's a great leader, who had millions of people vote for him, who tells the story of how every year for thirty years he and his wife have celebrated their wedding anniversary at Wendy's because that's where they celebrated their very first anniversary—I need that guy to be the man I thought he was. His affair shouldn't discredit any of the great work he's done. But it discredits the man he is. My mom, who often gives her sons advice on how to avoid the ills of the world, often says that "nothing can pull a man down faster than a woman." The first time I heard her say that I was surprised because it was coming from a woman. But I don't think she was saying that to put the blame on women, but instead to illustrate what can happen when a man can't control himself around a woman. We've seen far too many men who seemingly had too much to lose, risk it all for an affair. Bill Clinton. Michael Jordan. Eliot Spitzer. Reverend this. Doctor that. John Edwards. Come on guys, you're killing me. How ironic, a friend and I had the very same conversation a few days ago. Although disturbing, like many statistics, most men do cheat. Like the bible says men are physical beings. Men and women are simply wired differently; divine design by our creator. Men are easily tempted by what looks good, and will make rash decisions just on the foundation of being physically attracted to a woman. Men and women need to pray for God to protect there minds and thoughts from ill intentions and impure thoughts. I’m not the most religious person in the world, but I learned this in church last week and it really does help. On a good note, I really like your blog, I find the commentary to be witty, enlighten and just fun to read! I definately didn't see this coming. 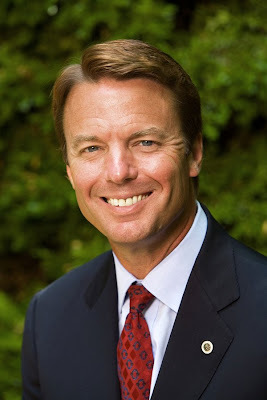 I mean John Edwards...come on! Yes, we are all human and fall short of being perfect. However, John should have used better judgement considering his political background. Bottom line, MEN Cheat! I guess, we will have to keep hope alive that not all men cheat as you say. I really enjoy reading your blog. First off, I really like your blogs as they are insightful and “creatively speaking” to me personally. On to the subject at hand. Cheating by men and women is a plague in our society. I won't deny the fact that most men do cheat but I join you, Jarvis in the fact that i've never cheated on any woman i've dated. It's a matter of self-control and dignity. As Oprah once said, “the highest character of a person is measured by ‘what you will do when you think/know no one is watching.’“ All men aren't cheaters but it's really hard to tell (and believe) because the percentage is so small. I count for one of them and Jarvis another, so in an instance, you have two men that have never cheated on any woman. No lie, temptation is very hard to resist at times but I value who I am more so than what I might want. Rickles and Smith: Separated at Birth?